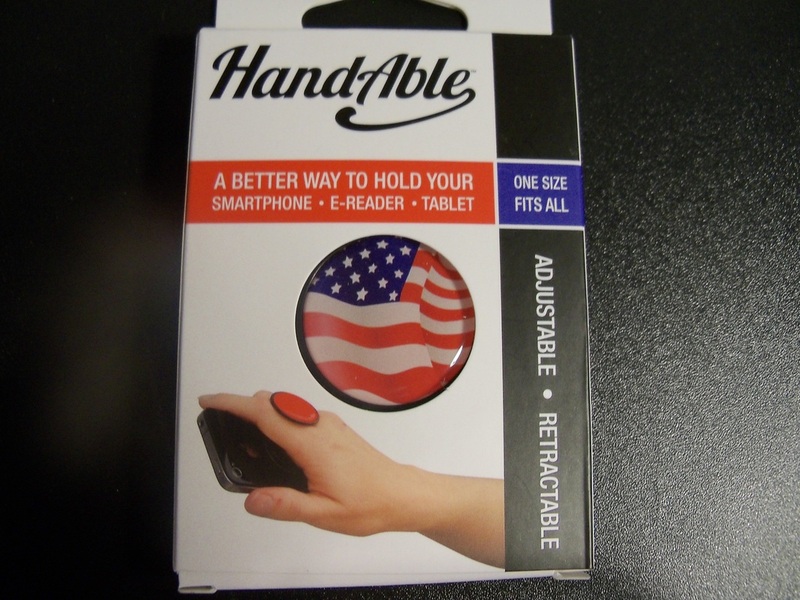 HandAble has sent me their American Flag HandAble. I have used it over the past few days and have got a pretty good feel for it. The HandAble is a really nice accessory to any SmartPhone or Tablet. I placed mine on my SmartPhone and it really works! First you have to place it on the back of your smartphone by using a peel and stick adhesive on the back of the HandAble. Hold it on your phone for about ten seconds and it is stuck. It holds very well to your phone and has great support. It adjusts to your fingers by pulling up on the button or down on the string. You use it by simply putting the button in between your fingers. This will give the extra support and confidence when holding your phone. If you have ever dropped your phone right out of your hand before this is your product. It will catch your phone before it even leaves your hand. Then when you put it back in your pocket just pull on the string and it retracts back for easy storage into your pocket. Unless you did what I did and just pull it all the way out and let the button hang at the top of your pocket so that it is easier to get your phone back out of your pocket. The HandAble is $12.95 for every color including the American Flag. This is a great deal, just head on down to www.HandAble.com and get yourself one today! !